Unlock the amazing potential of using multiple Blackmagic Micro Cinema Cameras (or Micro Studio Cameras) for 360 video, time-slicing, and 3D stereoscopic use. Our custom designed ‘J-Box’ is a breakout box for the Blackmagic Micro Cinema and Studio Camera that goes beyond the supplied breakout cable from Blackmagic, to offer convenient, pro-grade expansion and synchronization capabilities for up to 4 Blackmagic Micro Cinema Cameras or Micro Studio Cameras per J-Box. Additional units can be daisy chained to allow any number of BMMCC’s or BMMSC4k’s to be synchronized and controlled conveniently. These are the same J-Boxes as used in our EYE™ Professional VR Camera system. With these boxes you can readily roll your own Blackmagic Micro Camera based 360 video rigs. Originally designed for EYE™, the Blackmagic J-Box, available exclusively from 360 Designs, is the world’s first commercially available breakout box for the Blackmagic Micro Cinema Camera and Blackmagic Micro Studio 4k Cameras . With the breakout box you can readily take advantage of the many expansion capabilities of these pro-grade micro cameras, in a convenient and accessible way, to control and synchronize up to 4 cameras from a single box. The box makes use of the DB-HD15 (DE-15) expansion connectors on the Blackmagic cameras, which use a proprietary pinout, to breakout all the key connectors – Power, Genlock, Audio, Timecode, LANC and Futaba S-BUS (via terminal block) and combine them in a single distribution or junction box for 4 cameras. The box is primarily intended for 3D, 360 video and time slicing (aka Bullet Time) effects, where multiple Blackmagic cameras need to be conveniently controlled and synchronized. It is particularly useful in bench testing multiple Blackmagic micro cameras. The unit includes an onboard DC/DC converter, allowing the use of much higher capacity LiPo batteries, up to 10S (37v), to power multiple cameras from a single battery. A 12v accessory port is provided. While it is possible to solder your own cables for the Blackmagic’s, the connectors are hard to track down and spec, and are quite tricky to solder. Each J-Box includes almost 100 connections, are hand built, and take two days to make. Our product is designed to make connecting to these useful options on the Blackmagic Micro camera super easy. 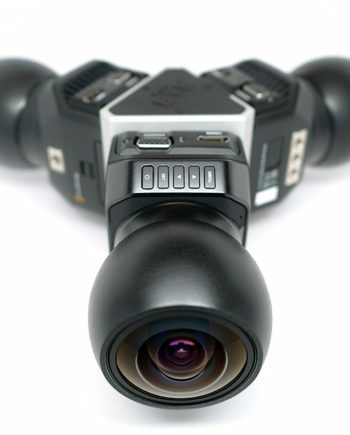 With a bit of creativity you can use take advantage of our custom J-Boxes to rapidly prototype a LiPo powered 360 video rig, or time slicing (Bullet Time) rig, using the Blackmagic micro cameras. 4 x Expansion Port (DB-HD15/DE-15) connectors (on the end of 4 x variable 6-12″ length cables), to directly connect up to 4 cameras to each box. The maximum distance between any 2 ‘furthest apart’ cameras is approx. 22″. A strain relief connector is included on each multi-core cable. Be advised these are thick cables. 2 x ‘Genlock’ BNC inputs on each box (each BNC input is split to 2 cameras). Now you can use pro-grade timecode generators, with BNC connectors, such as the Blackmagic Sync Generator or AJA GEN10, and distribute timing/synchronization signals to 4 Blackmagic cameras at once from a single generator. Since each of the above suggested generators have 6 BNC outputs, you can synchronize up to 12 cameras (using 3 J-Boxes) from a single sync generator, without the need for a distribution amplifier. 1 x Single LANC input using a 6-pin DIN plug. Each of the 4 camera’s LANC pins is broken out (replicated) to a pin on this 6-pin DIN socket, along with common LANC Power and Ground. LANC is a two-way serial protocol and will require separate logical controllers for each camera. (We’re working on a LANC accessory solution here – coming soon). 1 x Single Audio/Timecode input via a 7-pin DIN plug. 4 channels of mono audio can be fed in to the box and distributed to the 4 left channels on the cameras. A single timecode input can be fed in and distributed to the right channel of each camera, for ease of post-production workflow when dealing with multiple cameras in a 360 or multi-camera rig. We use a 7-pin DIN plug to avoid user confusion with the 6-pin LANC plug. (1 pin is unused). 1 x Single 18v-37v power output using the same 2.5mm connector as above, for daisy chaining power to up to 3 additional J-Boxes, for a total of 4 J-Boxes. More than this is not recommended due to the connector’s specified power limit of 150w. Each BMMCC pulls around 8 watts. 1 x Single 12v regulated accessory output using a standard 2.1mm 12v connector (max. power 60w) with locking ring capability. Use this 2.1mm plug for locking capability. N.B. Please use the links provided to purchase the connectors that you may need. Occasionally we will include a spare connector or two but this is not guaranteed. All boxes are hand made.